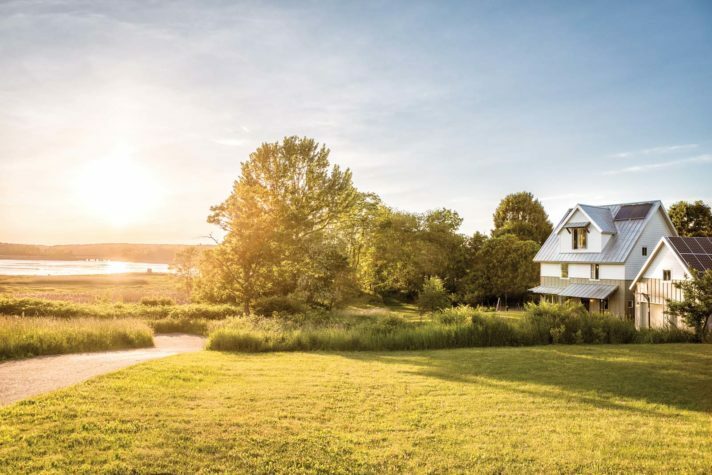 Designed by Phil Kaplan of Kaplan Thompson Architects and built by Dan Kolbert of Kolbert Building, this home in Falmouth is compact, eco-friendly, and cleverly sited to take advantage of the sweeping views of the Presumpscot River. The solar panels were installed by ReVision Energy of Portland. Artist Laura Fuller and librarian Stew MacLehose have amassed a wide collection of art over the years. 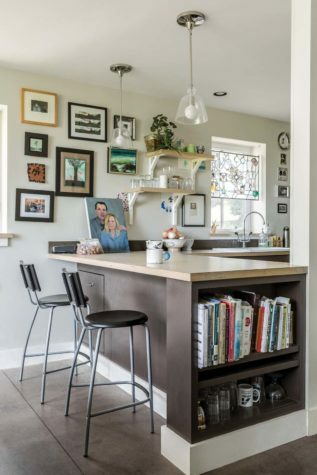 In the kitchen, they have pieces by local artists including Paul Brahms, Jean Pilk, Johanna Moore, Mary Harrington, Amy Ray, Carolyn Deininger, and Judy Glickman Lauder. 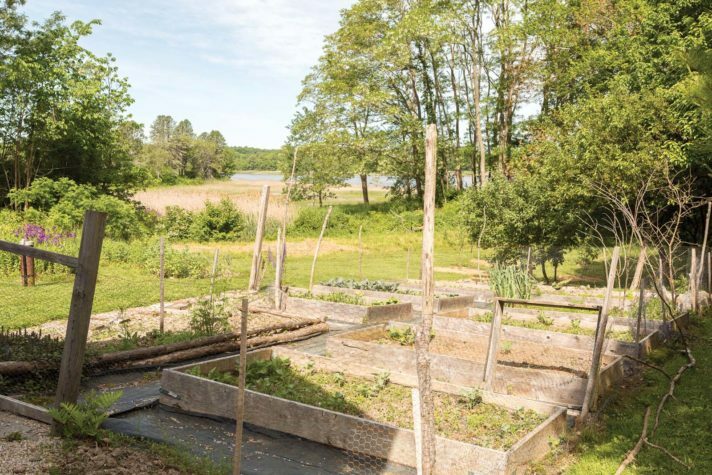 The couple grow broccoli, cabbage, fennel, kale, chard, garlic, beets, and more in their vegetable garden. Calvin MacLehose, Stew’s son, sits on the porch with Fuller and Stew. Builder Dan Kolbert created this porch from screen door panels, which were fixed in place and turned upsidedown to reflect the square shapes of the house’s high muntin. Fuller works on one of her stained glass pieces. The blue bottle design is a commission, while the larger piece is a passion project inspired by the chakras. Fuller works on an ocean-inspired chandelier that will soon be on display at K Colette in Portland. 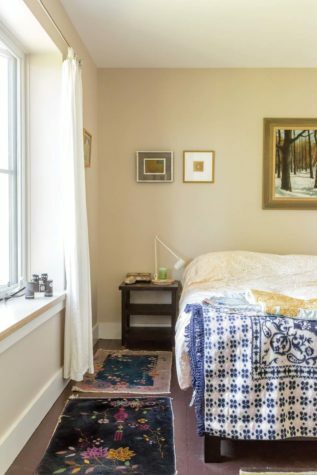 The owners’ bedroom features artwork by William Eric Brown (left), Amy Ray (center), and Carter Scattergood (above the bed). 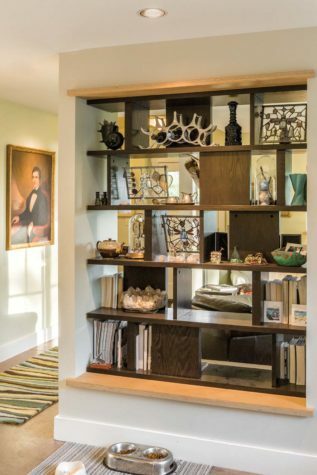 The living room is separated from the dining room by two-way shelving that provides some privacy while offering ample space to display Fuller’s art. The painting on the wall is a MacLehose family heirloom. The rug in the hallway is by Angela Adams. The home’s form was inspired by the shape of a cube, which helps make it efficient to heat. 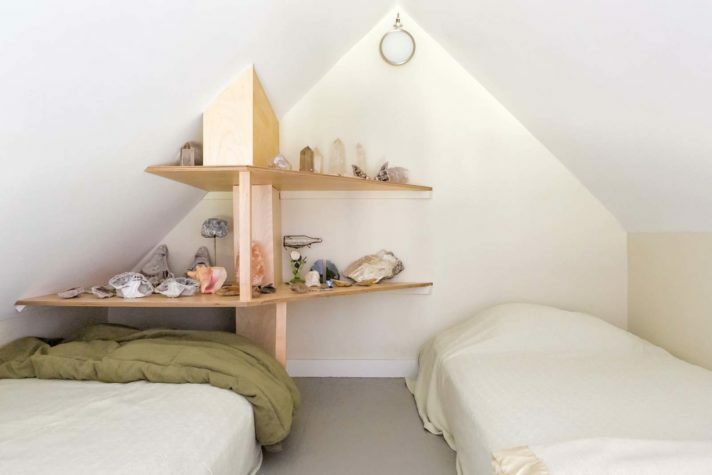 Above Fuller’s studio is a small loft space with two daybeds and a collection of stones, shells, and glass bottles. 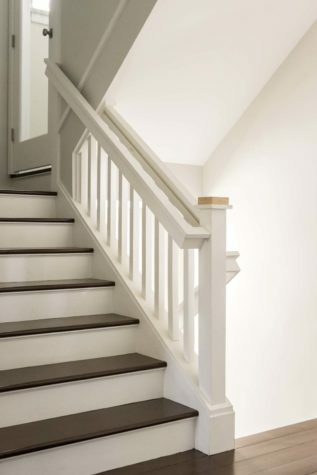 The stair rails built by Kolbert feature Baltic birch as trim detail. 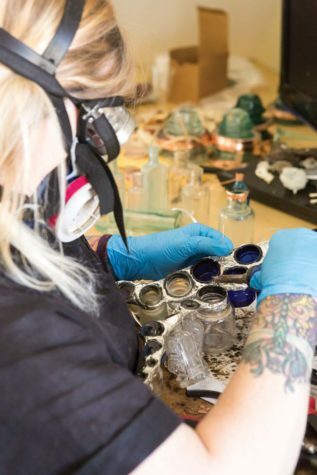 At the top of a narrow staircase, in a sunny room with slanted ceilings overlooking the Presumpscot River, stained glass artist Laura Fuller is examining a piece of blue glass. She picks it up and lets it catch the light for a moment before placing it back down on a piece of white paper, where it joins with cut-glass pieces and fragments of shell to form an intricate pattern of blossoms. 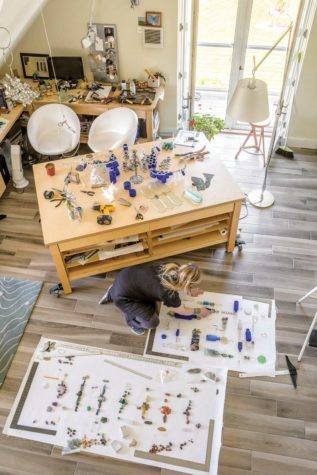 Someday soon, Fuller will fuse these many angled objects, welding them into a glimmering, prismatic window inspired, as she explains, by the seven chakras. But for now, she places the cobalt glass back in place and slides the pieces out of sight into her custom-built cabinet. Before, the space served very different purposes. It was first a barebones office, then a rec room, complete with a Ping-Pong table and unassuming painted plywood floors. It wasn’t until 2015 that Fuller and her husband, Stew MacLehose, decided to renovate this space and turn it into the utilitarian-yet-inspired studio that it is today. Fortunately, as far as floor plans and volume go, a home designed as a cube is extremely energy efficient to heat—and the shape also happened to suit MacLehose and Hayden’s aesthetic sense to a T. The house packs in a living room, dining room, and kitchen on the first floor; three bedrooms on the second floor; and an artist’s studio on the third floor, plus a rustic porch is attached to the dining room by a screened outdoor hallway. All these rooms (plus three and a half baths) come in at 2,200 square feet, thanks to the space- and energy-saving design. 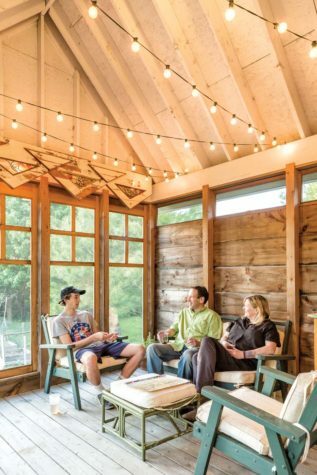 “The ideal form for a high-performing home is a cube, and that’s essentially what we built—a cube with a pitched roof,” Kaplan explains. (Not only does the pitched roof help this contemporary-style house fit in better with its colonial-style neighbors, but it also allows snowfall to slide off during intense winters.) “With this design, we were looking at optimization on all counts, including affordability, buildability, energy efficiency, and—in the back of my mind—replicability. If we could pull it off here, it could be a precedent for moving forward,” Kaplan says. 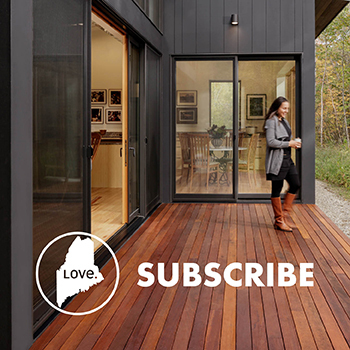 Builder Dan Kolbert of Kolbert Building in Portland was brought on early in the process to help navigate the tricky process of creating a high-performing, low-cost home in a particularly humid part of Maine. 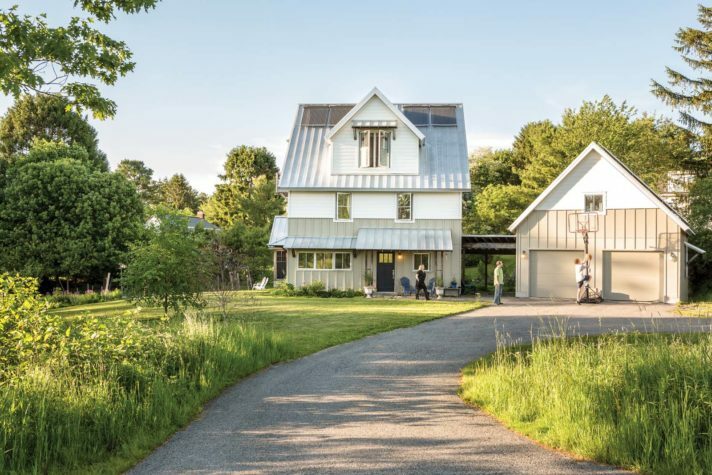 “We found that the basic idea of the double walls with the dense-packed cellulose insulation, as well as the way we did the insulated pitched roof, turned out to be the best way to go about making a high-performance house,” Kolbert says. The roof was particularly tricky, since often homes lose heat through the rafters, which serve as conduits carrying warmth from the inside of the house to the outside world. “The technical term for that is ‘thermal bridge’—something that is bridging your insulation and thus short-circuiting it,” Kolbert explains. To get around this issue, Kolbert and Kaplan came up with a system that imposes a thermal break by creating a gap between the timbers that frame the house and the timbers that frame the roof. 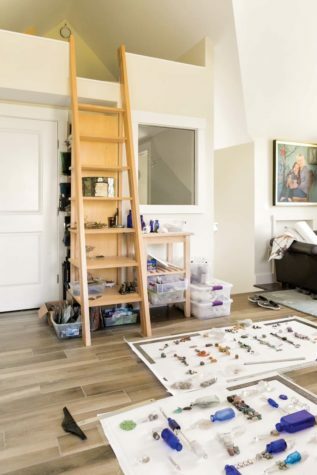 One of the benefits of this particular building technique is that it created a highly usable upstairs space. Since they decided to build the house on a concrete slab in order to provide radiant floor heating, the home lacks a basement, so fortunately the space they lost below ground could be gained back above. Fuller’s art is visible throughout the house, making a particular impact downstairs. A large stained glass window hangs in the kitchen, and other pieces sit on the shelves that separate the living space from the dining area. The many spacious triple-glazed and double-paned windows create natural frames for her art. “Phil chose the orientation of the house,” says MacLehose. “His primary concern was getting optimal solar gain, but he also did a fantastic job placing the windows so that we have views of the water and views of the garden.” In the dining area, Kaplan decided to extend the window all the way up to the ceiling. He notes that there is no head casing—the wide strip of trim that often appears on the top of a window under the crown moulding—which contributes to the streamlined feel. “The goal was to make that space feel as open as possible and larger than it actually is,” he says. All the windows in the house, as well as the countertops, are trimmed with layers of Baltic birch plywood, subtle stripes of lightly colored wood that provide a visual echo in each room, tying the overall aesthetic together.